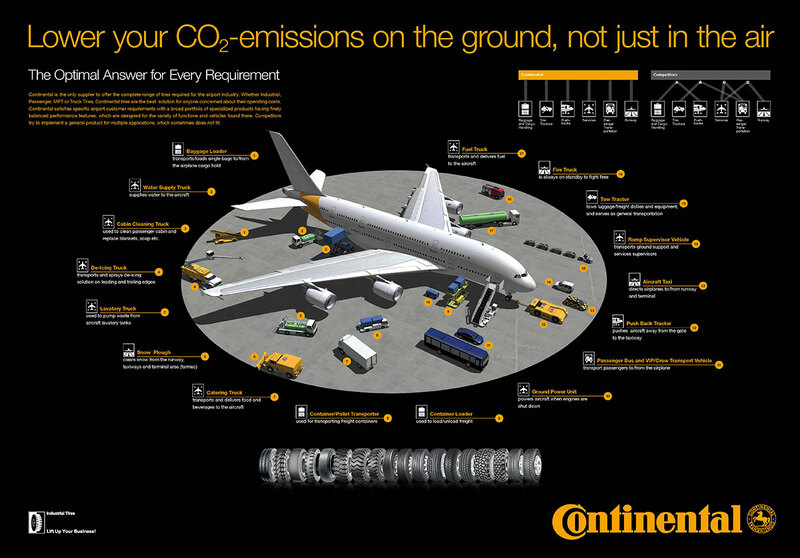 Continental is the only supplier to offer a complete range of tires required for the airport industry. Whether industrial, passenger, truck or multi-purpose tires, Continental tires are the best solution for airport operators concerned about their costs. The optimal answer for every requirement at zero altitude: Continental offers an extensive suite of tires required for airport ground support operations. Continental's engineering features allow for reduced operating costs, through technologies such as lowered rolling resistance, minimization of creating foreign objects, ease of maintenance, durable tread compounds and tire constructions and much more. Why try to use the same tire for every airport application, when you can find a product for any airport need from Continental? The airport poster below shows all vehicles available at the airport. The ContiRV20 is specifically designed for use on ground support equipment at the airports, especially tow tractors. The ribbed design minimises vibration, uneven wear and gives maximum ride comfort and mileage. With its innovative tread compound the ContiRV20 ensures low rolling resistance, which reduces fuel consumption and vehicle CO2 output. The robust construction minimises sidewall and foreign object damage (available as tubeless using TSR technology to reduce run flats). Due to the Natural Rubber compound the Continental SC20 Mileage+ and SH12 offer exceptionally low rolling resistance and low heat build up. This relates to extended tire life and reduced cost per hour. (More hours in between changes and lower fuel consumption) Combined with that is the soft ride offered due to the 3-stage construction of the tires. The softer ride relates to greater protection for the machine, loads carried and operating surface). The ContainerMasters tread pattern has been specially developed for Heavy Duty Forklifts and reach stackers, having a wide flat profile and dense tread rubber at the centre bar region which offers excellent durability and longer lifetime in severe abrasive conditions.